Mid-summer, but looks a bit like autumn! Gosh, we had a real storm last Saturday, really bad one. The kind we normally could expect in autumn. And still the weather isn;t fantastic, although it looks somewhat better and they say that by the end of the week all should be more quiet and tempw will rise again. Can't wait till that happens! I am still walking around with my taped glasses, had no message yet that the new one arrived. Hopefully it will be there this weekend, I am getting enough of wearing my glasses with pieces of tape on it. And even tape on the "legs"to attach it firmly to my head (I am afraid that my glasses will fall off, when I bend over or make a sudden move). Hard to be patient, but there is nothing else to do. Jan had to go working during that storm and I wasn;t happy about it. He did go on his bike, and found a route where he was sheltered well enough from the hardest wind. Lucky for him he didn;t had rain on the way. Last week, when I was doing some grocerie shopping I passed a flower shop where they have lots of garden plants too(always dangerous area for me LOL). and then I saw a dahlia, I just HAD to buy(and even better, it wasn;t expensive at all). 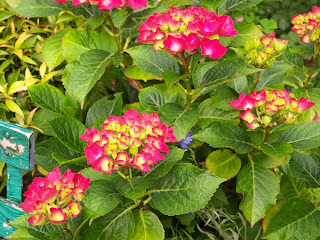 I just loved the colours of the flower and yes, I;ve made a photo. Isn't it looking gorgeous? When flowering time is over, I will cut the leaves of it somewhere end autumn and then I will put the tubers in the little shed, where they can wait till next spring in dry conditions. 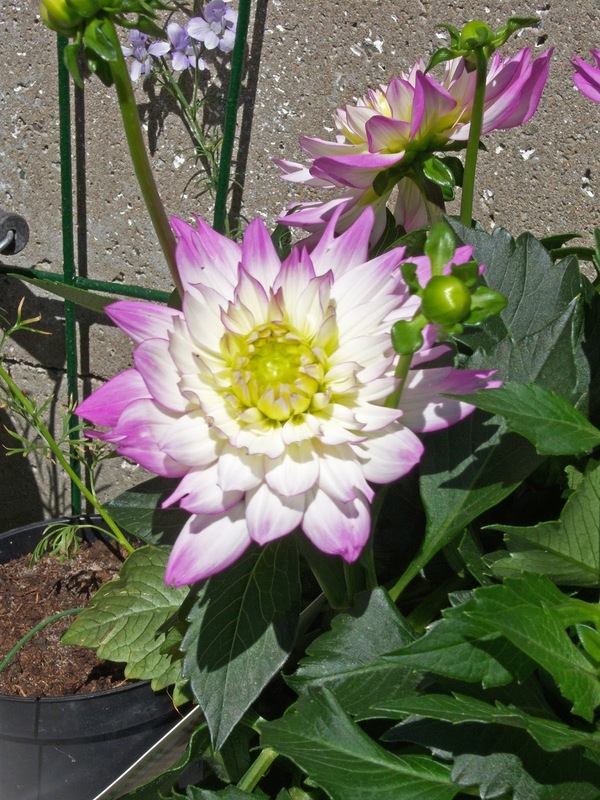 And may be I can take a few cuttings of the tubers to have more of this dahlia. It also seems that we have a yellow-white lilly too, I didn;t know that anymore. So we have some surprises every year in the garden, hahaha. 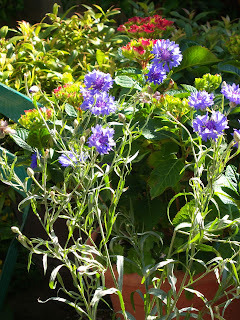 Jan and I are already starting to take seeds from several flowers to have new stock to sew next year. It's such great fun to see your "own"seeds grow to a beautiful plant. And in the neighbourhood I saw a very big sweetpea, from which I will take some seed pods too. But they aren;t dry enough yet. Today is again fish feeding day at Heidi's home. At the same time we collect the post and sort it out a bit. I was happy to see in the weekend, that no harm was done in her garden, because of that storm. Yes, I think I will grab a sandwich and then leave for the fish and when I come home again, I will start preparing dinner. I'll make a "boeuf parmentier", which is minced meat between two coats of potatoe mash. Oh, I even have some grated cheese to put over it when it goes into the oven, yeah, that makes it even tastier! And tomorrow I will have a very easy day, we will eat what's left of it. (even tastes better the second day). Okay, time to finish, and get busy. I hope to have a little kit for you next posting, am working on two at the same time, but slowly! Oh my, bad luck with spectacles. It was last Saturday in the afternoon that it happened. I had a little nap, just short, and awake again, I wanted to put on my spectacles. But it fell out of my hand, one "leg" of it had been broken. And on such a good moment, Saturday late afternoon! Well, I fixed it with a tape, for the moment. Next day I went into town centre to the shop to see, if they could mend it, or otherwise I needed a new pair of glasses. Couldn;t be fixed, so I ordered new spectacles. All not so very dramatic, it may seem, but it came financially on a really bad time. Not to worry, we'll manage, but sometimes those " accidents" take place at not the right moment. I guess everybody knows how that feels, we all encounter it every now and then. Hopefully my spectacles will be ready somewhere end of next week(they are slower with delivery because of holidays). This week Jan tackeled a window at the front, that had to be painted again. He first gave it a protection coating, then had to sand down, and yesterday he gave it the final coat. t sounds like a little job, but it always takes more time than you think. As he was busy outside I tackeld the inside, meaning I did the vacuum cleaning, dusting, cleaning some cupboard windows, doing a laundry etc. Normal stuff, actually, but I am happy I did it. Also took a few photos of the garden, but they are still on the camera, so they will have to wait for the next post. Weather here is still nice, not really warm, but fine enough to have the doors open at daytime. Today Jan has to go volunteering again, a week just passes by so quickly. And every other day someone of us has to go to Heidi's home to feed the fish and gather the post. Heidi called us this week, just to say that all is well and they arrived safely in France. The weather there is much warmer than here, so in general I think we are better off here. I have a freebie for you, made by Arlene with the Galina kit. Sending you all wishes for a happy and wonderful weekend. The last few days it was kind of funny weather, not cold, but very windy, cloudy at times, even the garden was happy, there was some rain. 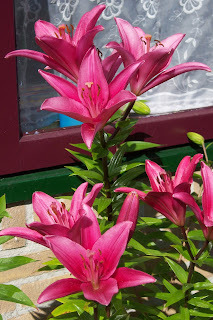 Today it looks better again, much more sunshine, still just a little too much wind for me, but temperature is okay, in our garden it is very nice, at times even kind of hot in the sun(because we have a rather sheltered garden). But I am not complaining, far from it. Wednesday I did a control of my weight and whoopieeeeeee, it was kind of party-time. I just passed 35 kg's! I know, it doesn;t sound much, but I never was a heavy weight. In my very best days, much younger too, (and mostly only in vacation time) I topped on about 40 kg. But if you consider how bad it was when I had the pneumonia (last day at the hospital I had 30,8 at the scales and that really scared me! ), I am entitled to be happy. Okay, I am not yet totally there, I want to try to reach perhaps 37 and stay on it, I think that is good enough. But I did a little jumping just out of joy.LOL! 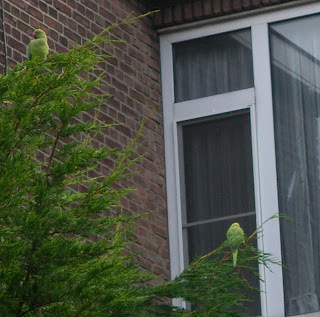 For several years already there is a colonie of green parakeets in a park not very far from our home. 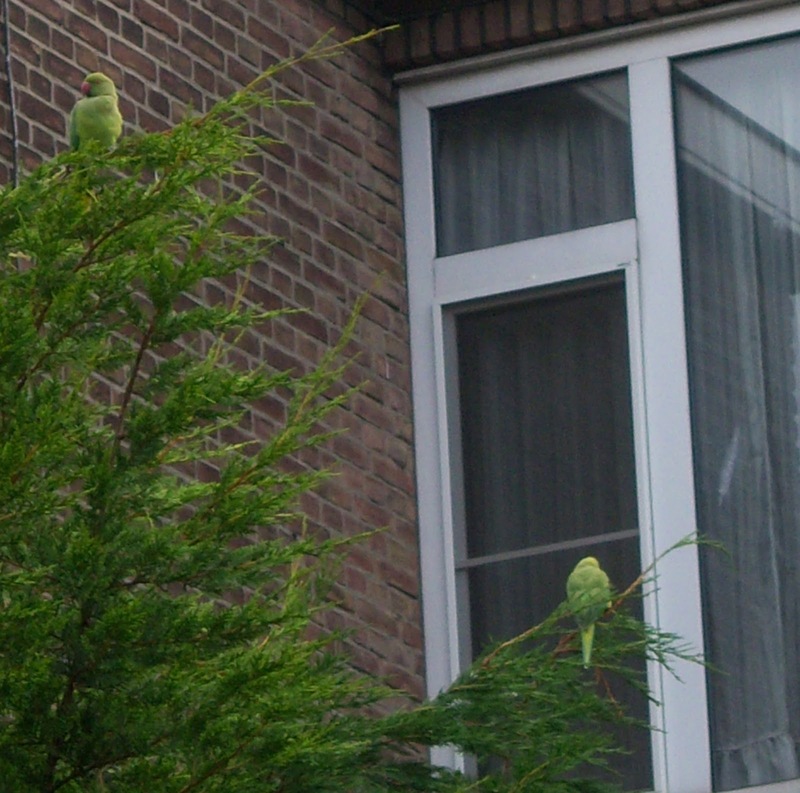 But now they spread a bit more, I guess, and they come visit our neighbourhood too. They can make an aweful lot of noise, but I just love to see them. Lucky there are still some trees in some gardens, where they can sit down and "chat"with eachother. I tried to make a photo, which is hard, because my little camera doesn;t have a very powerful zoom, but at least you can see them on the photo. 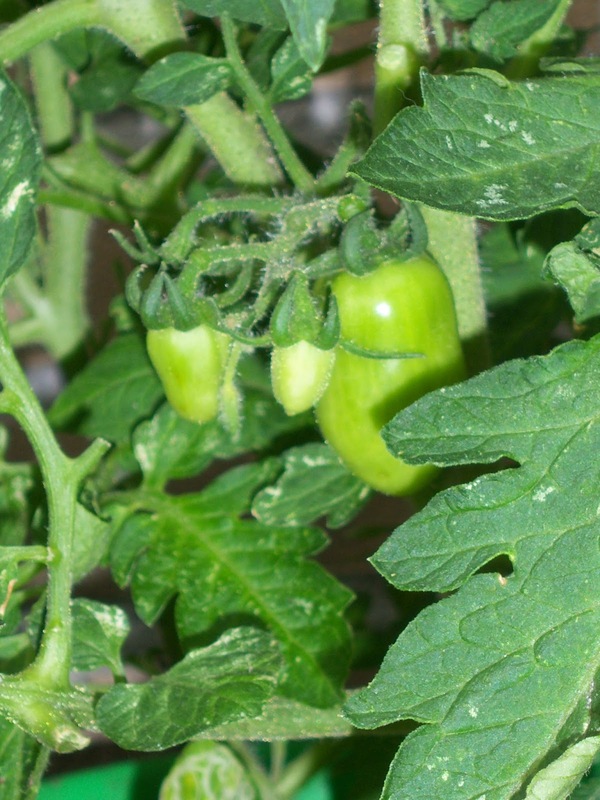 And I have a phto of one of our tomatoe plants, and don;t ask me how much, but we definately will have some tomatoes, ROFL. 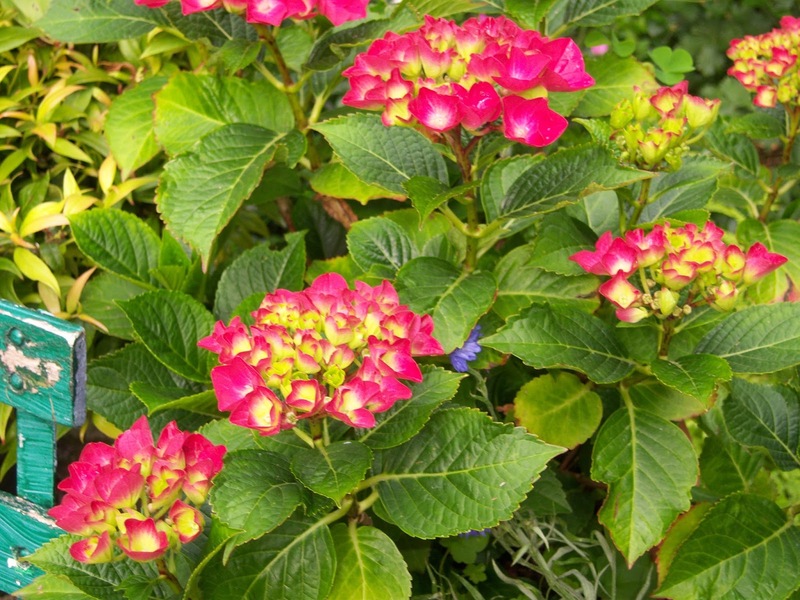 I have another hydrangea for you, I just love to shrubs, they are rather easy to handle, and they have lovely flowers. Then here is the garden-suprise of the year for us. After years of trying we finally have hollyhocks! I have absolutely NO idea how they have come there, well, I probably threw at a time some seeds I collected in the garden to see if that would do better than grow them first in little containers from seed. Suddenly this year I saw those big leaves growing, and at first I really had no idea what it could be. Almost was at a point to take it out, assuming it only could be a kind of weed. 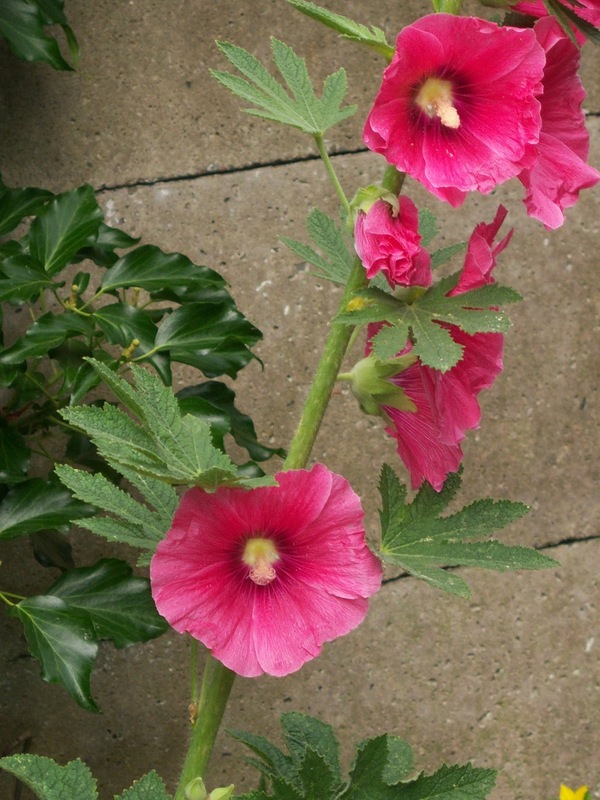 Then I saw the leaves and some buds and realized it could be hollyhock, and well, it is! Now I will try to get more of them, I still have seeds of one with beautiful double apricot flowers: Oh, if I ever could grow those, it would be fantastic. But here already the surprise/ones. Well, what else can I chat about? 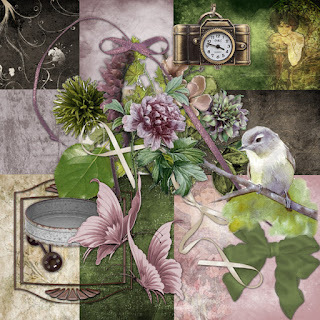 Nothing much happened this week, I did some usual things in and around the house, all rather realxed, I must say, and how wonderful that still is. Jan yesterday went to his volunteer job, as well as he will go today and tomorrow. I still have dispensation, to recover and don;t have to come back to my coach until beginning of Septemeber. 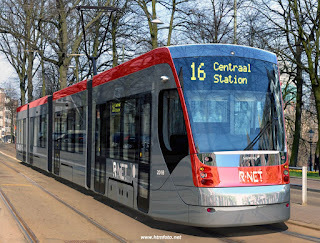 Oh yes, this morning, looking out of the front window, I saw the new tram passing by. Yes, part of the trams will be replaced by these new ones and I must say they look quite good. They are just testing them on the routes they will drive on, we cannot go with them yet. 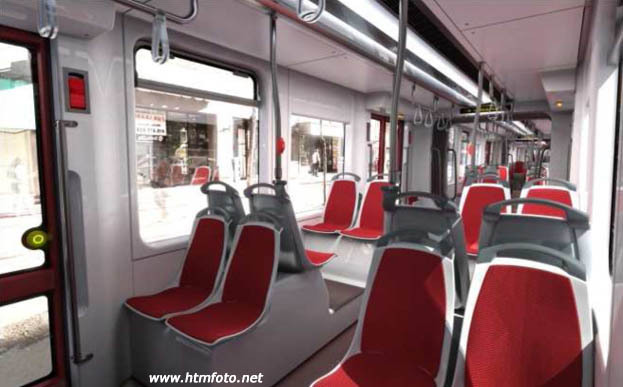 I think our line will be riding for public at the end of August. Found you a picture on the net of them. And that's it for now again. But.......not leaving without a freebie for you. 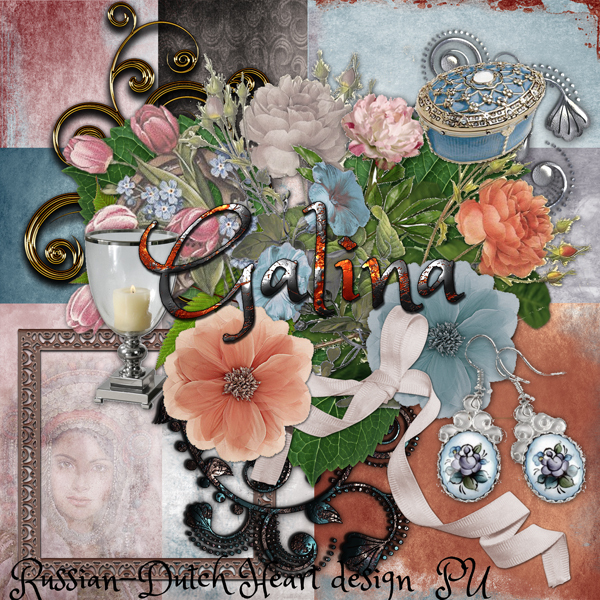 Yes, finally finished the kit and made the preview and uploaded it, so here it is, named "Galina". It is Russian name, I looked it up and the meaning of the name is "quiet and peace". Nice hey? I first thought to split the download because it is a rather heavy one in MB, then thought "okay, I am only posting once, may be twice a week now, I better give them the whole kit to play with right away". Hope you will like the colour pallet, I am working on a more summer-like kit, but you know it by now, I don;t know when that one will be ready. Now it is time to finish, there is a nice quiz on tv at the moment, so the right time to have a sandwich and cup of coffee. Have a wonderful weekend and till next time, somewhere next week. Heat gone, lovely summer weather now. First I wanted to do a post yesterday, but I didn't get to it. The whole week we are not too busy, but every day doing something in or around the house. Yeah, sometimes that is needed, you know! But today is an easy day, we have lovely weather not too warm, but nice summer weather, and at the moment Jan and I are both at our laptops. And it is soooooooooo quiet. Well, In about 1 hour Jan has to leave for his volunteer work till 19.00 a.m. and when he comes back I will make us a quick meal of a hamburger on a hamburger roll, with some salad and onions on it and after we have some strawberries with cream. Nice enough for a Saturday´s dinner, isn´t it? 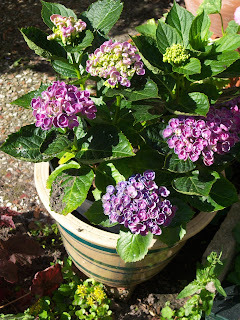 I did some pruning work in the garden, and also took some photos again. 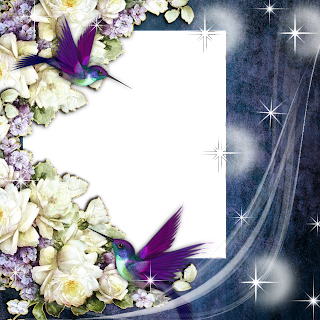 Best I show them right away, because I don;t have much to tell and it fills the space LOL! 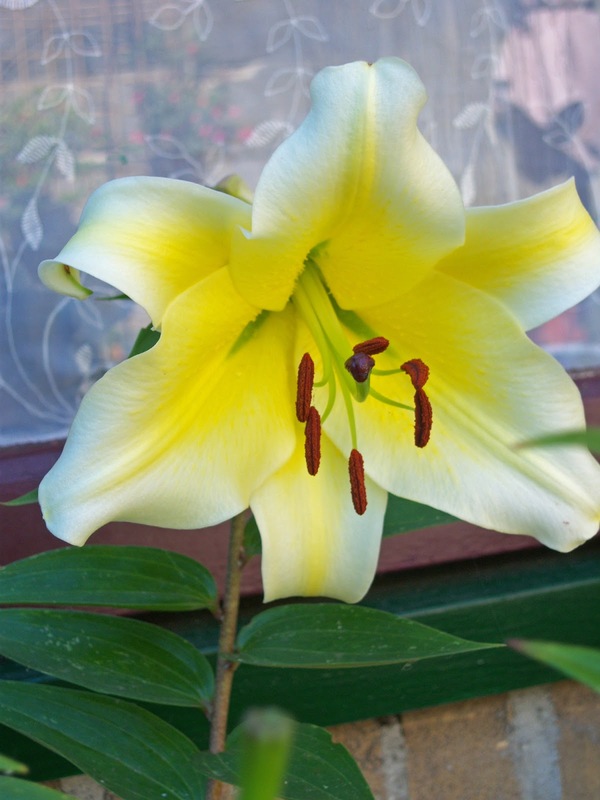 First one is of the lilies, that I really like! Next year I want to split them up, and hopefully have two big pots with them, or may be even somewhere in the flowerbed. I also have several hydranges, one of them is the big white one, but also have a dark pink ne and then this one in a lovely purple/lilac/blue. 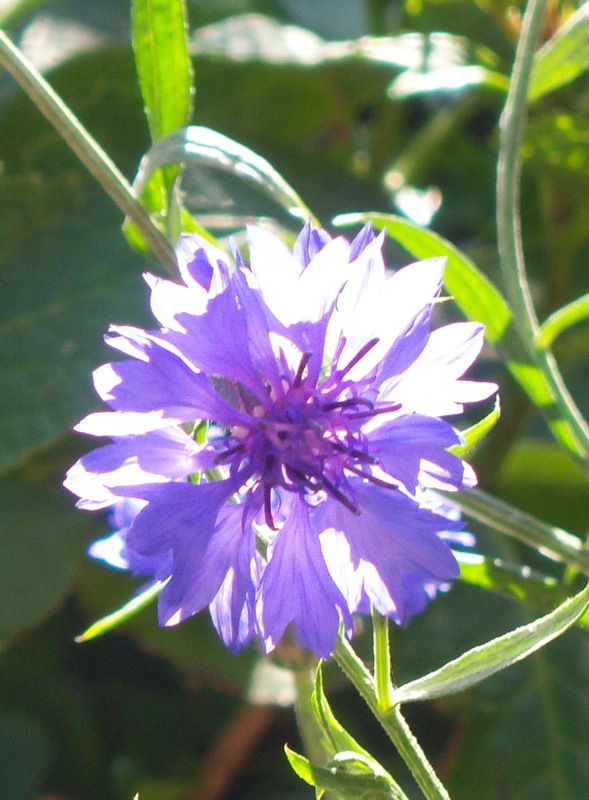 Then somewhere at some time we seem to have had some seeds of a cornflower( at least, I think it is that), and although the whole plant isn;t really beautiful I just LOVE the bloom and color of it. 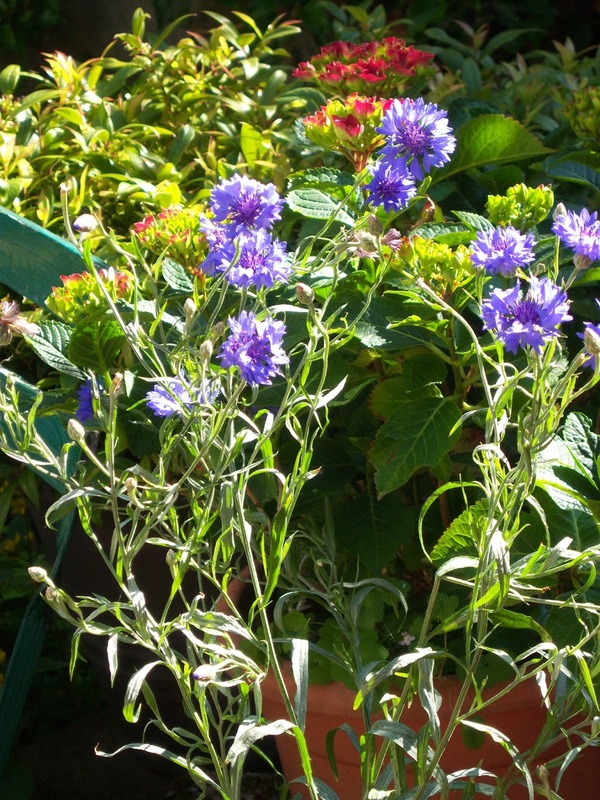 So I must get me some seeds of it later this summer and try to grow it again. I even cropped one flower of it, so you can actually see how loely the flowerhead is. It is a spectacular color. 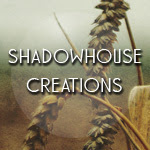 Oh, I also have a nice link for you to visit, if you want to grow herbs in your garden, but have a lot of shadow in it. There are still a lot of possibilities to have your own fresh herbs. And another site where you can get inspiration for DIY projects for your garden)and for low cost too. Some are really great and funny. I still am low on designing(what else is new LOL! 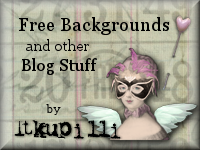 ), but......I´ve made you a little freebie for this weekend, it is a quickpage and I hope you can find use for it. 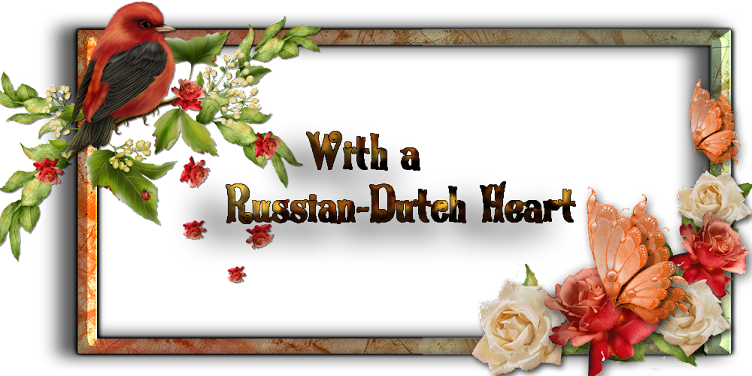 Now in about 1/2 hour Jan will leave, then I think I will quickly clean the kitchen floor and already prepare as much as possible for the dinner, and then I might play a little game on the computer and then Jan will be home and it will be a nice evening, with one or even two detectives to watch. Oh, no, I have some more for you, almost forgot it. I found a great and easy recipee for an ovendish, with broccoli. It's just that you have to put Google translate or something like on it, because it is a website in Dutch and I am now just too lazy to translate, hahahaha . And believe it or not, just got a phonecall from Heidi, with the question if I could go to the dogs and let them out. She is at the beach now and it is such nice weather that she called me. First I called her some(not too bad) names, but of course I am a too nice of person to say "no", grin! So in a minute I will have to go to those poor creatures and make them happy. Well, I say bye, bye and wish you a lovely weekend! We both were busy yesterday! 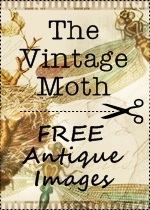 I first wanted to do a blogpost yesterday, but didn;t get to it. I just checked email, looked up some things on internet and then already got busy. It was nice but not too warm weather so I thought it was a good time to have a walk to the market. Why? I had some bills for payment to deposit at the bank, and that's on the way to the market. Because I was earlier at the market as I usual am, it wasn't over-crowded yet. Not much I needed, but found some fruit and bought us some cheese and little bit of veggies. I took my time there, didn't rush over it and came hme with a good feeling. Coming home I saw Jan busy with washing the windows at the front. He washed the curtain also and then went on to the back and did the windows there to, inside and outside and also washed the big curtains too. Wow, my hubby sometimes is fantastic!! In the meantime, I did some ironing and thought it was time to right away put the finished stuff into the closet and looking at some shelves I thought they might do with some re-arranging. So took out most of the towels, bedsheets, someclothes too(like t-shirts and such) and folded almost all over and put it back. It looks s much better now(just wondering for how long it will last? LOL). So all together we were busy and time was well-spend. Of course we both took some breaks, we are no young puppies anymore who can go on almost endlessly, grin-grin. But it's wonderful already that we have back some of our energy and such. Part of it due to my gaining weight and feeling better wevery week, I think I am back to about 85-90% again, so still some work to do there, but hey, I am happy with it already. Oh, last weekend Jan and I watched the final of the worldchampionship women-soccer, it was between USA and Japan and I have to congratulate all my American followers. Your team won and I can say you have a wonderful women soccer team! I really hope women soccer will be watched more more, and the women-fotballers could also do with a bit better payment than the men's teams. And why? Because the women still play the game as it's meant to be, with lots more of enthusiasm, dedication, will-power, energy, and much less fouls. Think today will be another day of doing things in and around the house. Jan said he wanted to do the last bit of the windows today(outside at the front,) and he also wants to sand down one window frame at the front, so that he can finally paint it one of these days. Now I will have to find something for me to do too! !Just kidding, there are enough things I can do here, only have to decide what. In about two weeks Heidi and family will go on their vacation, so Jan and I will look after the fish and house then again. We will have to go there only every other day for the fish. And sometimes we will have to water the garden, if we will have more summerdays like lately. But that's what friends do for eachother, no big deal. School-days are about over for Séverine now, and she just did her 1st year at highschool, and did very well. We have here different "grades"of highschool, difficult to explain, but Heidi told me Séverine will follow a higher level next schoolyear, because this one appears to be too easy. she almost doesn;t do any homework at home, picks up everything so easily and her notes prove she can do more difficult. We have a system of notes that goes from 1 to 10. All Séverine's figures on the schoolreport are an 8 and even one 9! So she is doing extremely well. Her parents can be proud of her! (and I am too, can you tell????). Think I rambled enough again for this time, so I say "bye-bye", wishing you all a fantastic day and rest of the week. It was a nice and quiet weekend,. although the weather wasn't at its best. On the other hand, nature was happy with the cooler weather and the rain! I can see it in my garden too. So there isn;t all too much to tell, how wonderful to be able to say so again, LOL! I wonder if many people know who "The Matilda's " are?? I suppose not, so I will tell you. Jan and I watched their game against Brazil, ( game in knock out fase, so who ever wins goes to next round) and guess what?????? 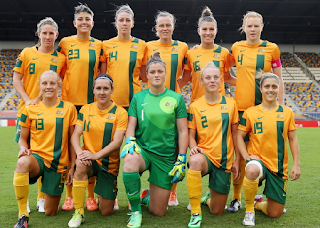 They won it, it was a great achievement and I congratulate all you Aussies. Yes, we are following the championship rather close, and there have been already some wonderful matches and hopefully some more to come. If you are supporter of a team, you do what is necessary LOL! 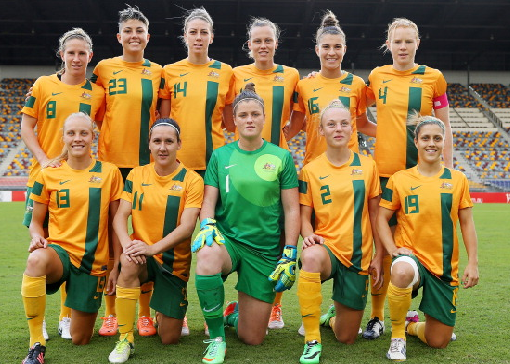 It will be a difficult match for our "Orange Lionesses". but sometimes miracles do happen! Today is looking not too well outside, cloudy, every now and them some rain, but later this week it should be better, even temparatures of about 21C. Not too bad, I think. No real plans for today, but there is always something to do in the house, hmmmm, but.......I also started this weekend with a new kit. It's not going quick, but every time I am at the computer I will try to make some elements and / or papers and get into the "gear"again. I have a freebie for you, clusters from Arlene. made with the Solveig's Song kit. 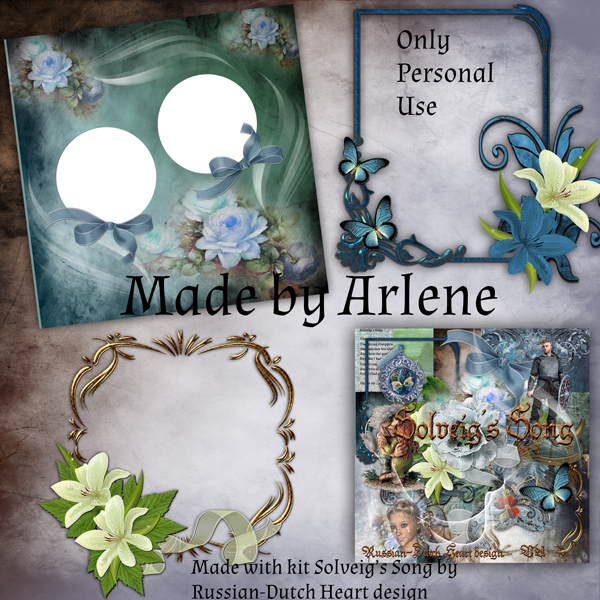 She has made a super-duper quickpage too! The Netherlands suffers from a heat-wave!! Yes, it is true. Sme days this week have been very hot, temps around 95F, and that is real high overhdere. And today it will be very warm too and tomorrow they are expecting another heatwave-day. I don;t mind if we have some nice temperatures and sunshine and such, but this is also for me way too much. Really tough for people who have to work now, even if there is airconditioning around. 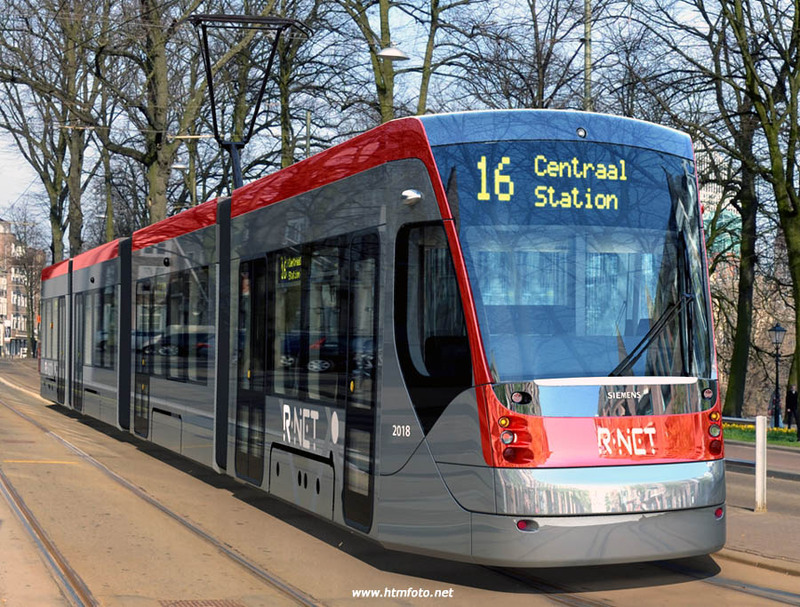 Today is also the start of the Tour de France and it starts in.................Utrecht, city in the centre of the Netherlands! Imagine, a big cycle tour, called Tour de France and starting in another country! (which is the case already for several years). Lots of money involved there, that's the whole point. But not the best day fr cycling and certainly nt for people who want to watch it along the road and at the start, with this very, very warm weather. Everywhere there is extra water supply, warnings have been done on tv and radio that people really should be careful to be out in these circumstances. My poor hubby has to go to his volunteer work too, for the first time since long. In fact he has happy to do it again, only bad planning this weekend because of the extreme weather conditions. But he still is lucky, only working for 3 hours a day this weekend. When he went over to the nursery home about two weeks ago, to say he was able to come again starting this weekend, it was nice to hear, that they kept his working place, and that he shouldn;t be replaced on another department. Our garden has more and more blooming plants now, only with this kind of weather, we have to water the garden almost every day. Specially the pots need it. A good rain shower could do wonders!! We also have something in our garden which worries us a bit. At the back of the garden Jan found a young pigeon, who apparantly cannot fly yet. He looks kind of allright, but I am not sure if this youngster will survive. We did put several little bowls with water in its surrounding, and we have the idea that its mother is still watching over it at times. We also spread a bit of food at the place, but we don;t know if the youngster can eat by itself or has to be fed by mommy. If it doesn;t survive, it is just nature having its way, but I don;t like it, specially not if it happens in my garden. On the other hand the little pond has lots of non-paying lodgers, most are froggs, but I also saw two little toads. They all really adopted our little pond and the garden, must be good circumstances for them LOL! Have to think now about my dinner this evening. It should be something quick and tasty, just like we had yesterday evening. The day before I prepared a whole chicken in the oven, of which we had a part. But there was still a lot of left over, so I made a salad with it(recipee found on internet, really tasty, here the link http://www.kayotic.nl/blog/curried-chicken-salad. It is a wonderful blog, with lots of easy to follow and make recipees, and I just stubled upon it! I have found one more freebie for you in my stock( that really needs a resupply, but it is going soooooooooooo slow, perhaps it also has to do with the weather, to good to be at the computer for a long time). Oh gosh, I only noticed now that on the preview I didn;t put on the name and such!!! How very sloppy of me! I named it Carezza, (Caress), lucky I did name the file. And now time for me to slowly get going, well, first I will make some coffee, when it is ready I will wake up Jan, then we will probably have our coffee in the garden where it is still nice at this moment. Then I will have to take a sandwich and then we'll see what comes into my mind to fill the afternoon with hahahahahah!! Have a wonderful weekend you all.